This article alleges an abuse of the Freedom of Information Act 1983 (FOI) by the Australian Prudential and Regulatory Authority (APRA). (d) material maintained for reference purposes that is otherwise publicly available. The documents APRA provided VOFF were generic and publicly available documents, meaning there was not a single success. The documents can be downloaded from the your ‘Right to Know’ website. Of the two successful, APRA cite in both cases section 24A(1)(b)(ii) of the FOI Act - refuse access as the documents do not exist. The partially successful turned out to be unfinished correspondence where APRA reduced a $60.00 charge to $45.00 but it is unclear if the applicant continued or indeed obtained the documents that were requested/offered. From the 42 APRA FOIs on the your ‘Right to Know’ web site, there is not a single success. Among this category only the ‘correspondence’ documents can be termed FOI documents. APRA provides hyperlinks to the generic and publicly available documents, but there are no hyperlinks to the ‘correspondence’ documents therefore it is not possible to say if they satisfied the spirit of the FOI Act or not. But this does illustrate that what APRA listed as 35 successful FOIs can only be seven at best. There is a level of predictability with APRA’s reliance on section 56 of the APRA Act. VOFF have been offered documents by APRA under the FOI Act for a charge of $250 and $405 but fear prevented VOFF from testing the possibility of receiving documentation after paying a charge. 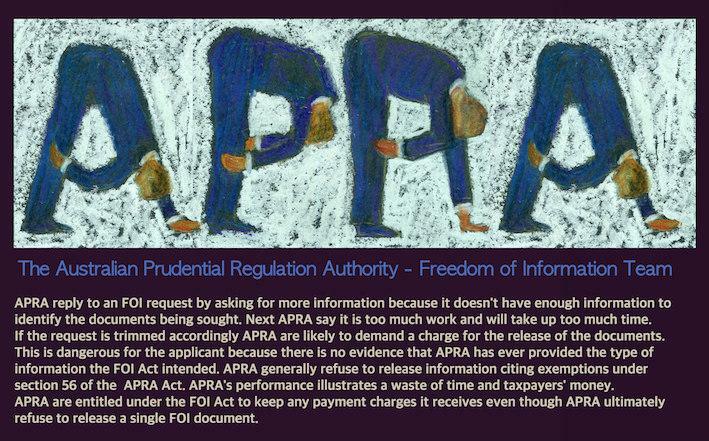 Under the FOI Act, APRA are entitled to keep a charge payment even if the documents are ultimately refused. It is understood that the Australian Security Intelligence Organisation (ASIO) are exempt from the FOI Act. Perhaps APRA should also be made exempt. An applicant seeking information from APRA may be required to re-submit a revised version of the request or reduce the scope of the request. This is carried out in view that the applicant is seeking information. All this is done in stages through correspondence with APRA. When most FOIs are consistently refused, this raises the question, why would APRA engage in correspondence that can last many months and consist of numerous letters when they already know they will refuse? APRA’s FOI legal team must have some idea by the request whether documentation will be made publicly available or not. In addition to revising a request, APRA sometimes bunch separate FOI requests together and then claim the resulting larger request is too much work. APRA are permitted to do this under the FOI Act. A recent example where four manageable requests from VOFF were bunched by APRA and then refused, although the applicant managed to keep the request active by further changes. VOFF did this by closing two of the requests and the remaining two were trimmed. The Office of the Australian Information Commissioner (OAIC) became involved in the communication process with APRA over the further revision of the request so that it met APRA's approval. This process involved the OAIC’s time and effort but ultimately APRA refused under section 56 of the APRA Act. The blanket refusal of FOI requests by citing Section 56 of the APRA Act is problematic when charges can be introduced. I am concerned for Australians that apply to APRA for information under the FOI Act because ‘charges’ can be legitimately asked, once APRA receive the money APRA can legitimately refuse the documents and legitimately refuse the refund of money. It could be argued that some FOI applicants are happy to receive generic and publicly available documents. But it is alarming that APRA is unable to provide documents that would show Australians exactly what APRA do, or provide information about government policies, programs and decision-making processes. Below is a copy of APRA’s reply to the recent correspondence mentioned above in which four FOIs were reduced to two. (ref 4)Freedom of Information Guidelines Exemption Sections in the FOI ACT at 14.1.2 Prepared for the Department of the Prime Minister and Cabinet 9 October 2009 page 77.